Infant Behavior – Entering the Age of “No” - Motherhood Looms - Where's My Yarn? Getting into things is normal infant behavior – But she’s really cute, so that makes up for a lot! It’s happened. Eudora is growing up. Her infant behavior is getting more complex. 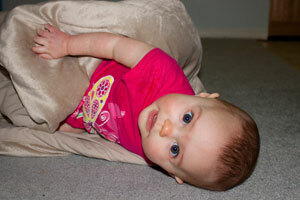 She’s learning to crawl and explore… and she’s learning to get into things. Some of the things that she likes are the same things that Norton loved. Today, I told her “no” for the very first time as I took something away from her. She cried. Of course, I understand that this is age appropriate infant behavior. She’s supposed to object to having things taken away. Up until this point, though, I’ve been able to give her something else and she’s been fine. Of course, up until this point, the only thing that I’ve had to take away was a dryer sheet that she picked up when I was folding laundry on the living room floor. My laptop is far more exciting, I guess, than a dryer sheet. Now that she’s starting to roam around the house, her little fingers will invariably pick up things that I’d rather they not find. No matter how well I think I’ve childproofed, there will always be something. Maybe it will be one of Norton’s treasured toys (he already freaked out when she was chewing on Pillow). Maybe it will be laundry. Either way, the world is filled with appetizing things for her to chew on that don’t belong in her mouth. On the bright side, she’s got such a sunny disposition that she doesn’t stay upset for long. That makes it a little easier to cope with the less pleasant aspects of infant behavior. Have your children ever found a forbidden object particularly fascinating? What was it? Too many desirable objects to count! I find myself taking something away more and more often as the days go on. She particularly likes the dog’s rawhide. Yuck! *snickers* Oh, you’ll eventually give up on that one. I gave up a long time ago. 😛 Dog and kid toys are fairly interchangeable at this point. As long as the dog doesn’t gut stuffies, it’s all good. I remember those days. We have entered the “no” stage part 2, where my little says “no” back. But he doesn’t usually say no, he hits his leg or the table… It’s taken a lot of patience and effort and we are working on dealing better with frustration. It’s a great journey, so worth it, but stages of “no” are… let’s say, trying?